The Electronic Frontier Foundation's recent post on Net Neutrality started off well. It rightly noted that "[v]iolations of network neutrality are a real and serious problem: in recent years we have seen dozens of ISPs in the U.S. and around the world interfere with and discriminate against traffic on their networks." This is indeed a huge problem. Broadband providers should do just what their name implies: provide you with an Internet connection — and stay away from controlling how you use it. But then EFF took a wrong turn, asserting that we shouldn't trust the FCC to save Net Neutrality. "The power to enforce equal treatment on the Internet," the post reads, "can easily become the power to control the Internet in less beneficent ways. … We are not confident that Internet users can trust the FCC, or any government agency, with open-ended regulatory authority of the Internet." This faulty argument is not at all in character for an Internet freedom, digital rights and civil liberties superstar like EFF. It's also not good enough given the recent gutting of the Federal Communications Commission's Net Neutrality rules. As a close friend and ally of EFF, we at Free Press offer a respectful counter-argument to the notion that the FCC should not be in charge of ensuring the Internet remains free and open. EFF worries about agency capture at the FCC, and about unchecked grants of "power to control the Internet." So do we. But like it or not, the FCC is the agency Congress charged with overseeing our nation's communications infrastructure. It used to do a really good job of drawing clean legal lines separating the networks that connect us from the content riding over those networks. It's only very recently that the FCC has moved away from that approach. It's our job now to get the agency back on track. The FCC just lost during its day in court — but not because the principle of Net Neutrality is anything less than essential. (In fact, the court agreed with the FCC's reasoning about the need for such protections.) The agency lost only because it chose the wrong legal theory to establish that principle. 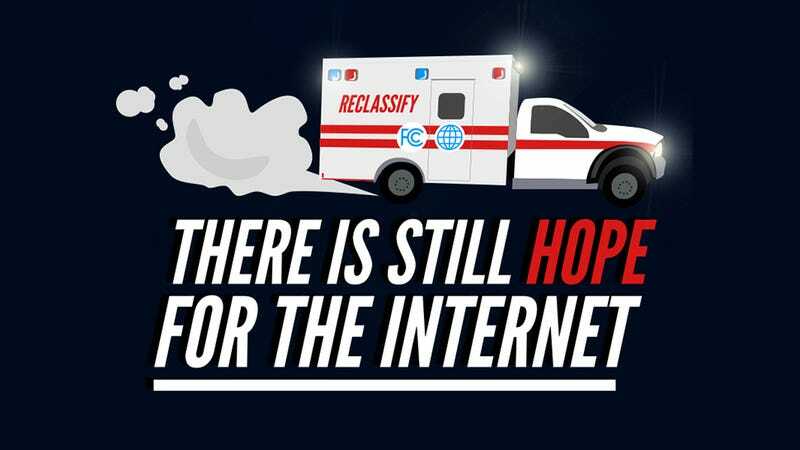 It may be true that there are no easy options here, especially considering the political climate millions of dollars in ISP lobbying has created. But there is a simple solution. As the court itself indicated, the FCC needs to clean up the mess it created. The agency needs to reclassify broadband as a "telecommunications service." That may sound like something weird and wonky, in large part because of ISPs' disinformation campaign to make it seem that way. But all reclassification means is the FCC calling broadband what it actually is: a service that allows users to transmit the information of their choosing between the points of their choosing. The FCC's existing classification of broadband makes it no different in the eyes of the law than any website or app. That's just silly. Reclassification is the right way — and really the only way — to prevent rampant blocking and discrimination. It's also the only way to restore the FCC's authority to promote the type of broadband competition and openness that EFF rightly cites as a solution to ISP discrimination. Reclassification would also address EFF's concerns about agency overreach. It would prevent the FCC from trying to control the content that rides over these communications networks and would instead restrict the agency's focus to keeping the networks themselves open. What was odd about EFF's post is that it never even mentioned reclassification. The piece fell into the usual trap of suggesting that the "ancillary authority" approach was the only way it could have gone. It concluded that "the FCC did not have explicit authority from Congress to issue network neutrality rules, especially after classifying Internet service as an 'information service.'" The FCC needs the right legal theory and statutes to preserve open Internet access without actually regulating the Internet. Fortunately, we already have those laws in place. It's just that the agency ignored its own powers for more than a decade at the behest of corporate lobbyists, cowering politicians and well-meaning advocates who sometimes suggest that the FCC should freeze in place rather than do the right thing. EFF is right about the slim-to-none chances for a legislative fix, in this Congress or any other in the foreseeable future. It's right about the need for more competition among broadband providers. But only the FCC can promote competition. Congress won't ride to the rescue, and alternatives like municipal broadband and unlicensed spectrum can't take off if incumbents cut them off at the FCC and in state legislatures around the country. EFF also suggested users should have the power to hold their own ISPs accountable for non-neutral behavior by challenging them in court. That's a nice idea. So nice, in fact, that it's already possible and noted right there in the Communications Act, if the FCC just reclassifies and decides to treat broadband like the essential telecom service it is. No one should underestimate the political difficulty reclassification poses. Broadband providers and their hired guns have convinced some people inside the Beltway that reclassification is impossible because, well, it just is. That's nonsense. The legal path to reclassification is plain, and everyone knows it. Plus, everyone but the big ISPs says it's the right thing to do. Some Net Neutrality supporters have psyched themselves out with the self-defeating (and self-fulfilling) notion that it can't be done. Recent history shows just how cramped and pessimistic this thinking is. After all, we do "impossible" things all the time when we work together. In 2013, Free Press joined EFF, along with hundreds of other groups and businesses and millions of activists around the globe, to fight the NSA's illegal spying programs. Before that, we all came together to stop SOPA, a bill that would have demolished Internet freedoms and the Internet's open architecture itself. We also put the brakes on a bill backed by the major Hollywood studios and congressional leaders in both parties. And even before that, we all came together to stop exactly the kinds of ISP discrimination and abuses that the EFF piece described. We called attention to browser redirects and Web-ad insertion tactics from companies like NebuAd. And Free Press complained about Verizon's blocking of free and low-cost tethering apps available for Android phones — with Verizon charging $15 extra each month for data its customers had already bought. Millions of people rallied in 2005 and 2006 to demand Net Neutrality. And now they're back. On Thursday — joined by the ACLU, Avaaz, ColorOfChange, Common Cause, CREDO, DailyKos, Demand Progress, Fight for the Future, the Harry Potter Alliance, MoveOn, RootsAction and the Sierra Club — we delivered more than 1 million petition signatures calling on the FCC to reclassify and to restore Net Neutrality. The answer may not be easy, but it's obvious. We're pleased that EFF has acknowledged the importance of Net Neutrality to any discussion of Internet freedom. Now it's time for EFF to join Free Press, hundreds of other organizations, and millions of people, to push the FCC to get it right this time.